On the General tab, you can view and modify general WAPT Pro settings. Maximum time of waiting for server operation: If the time of waiting for server operation exceeds this value, you will receive a timeout. It can be the time of waiting for server response, or the time of sending a request to the server, for example, time of uploading a file. This timeout indicates that you either have problems with the work of web server, or bad connectivity. 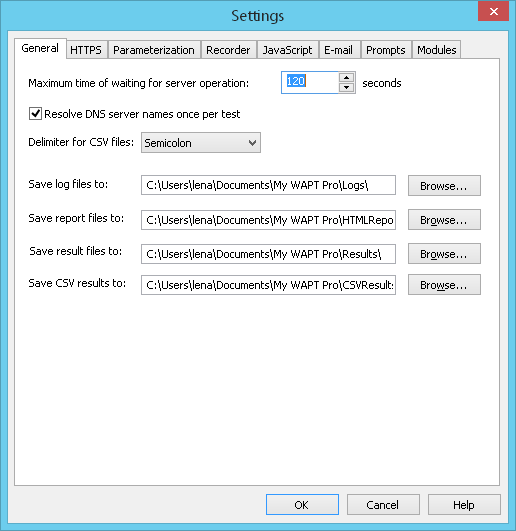 Resolve DNS server names once per test: This option defines how many times WAPT Pro should resolve DNS server names during the test. If you turn this option on, WAPT Pro will resolve server names once per test. The program keeps the resolved IP address in the internal cache and uses it during the current test run. However, sometimes you may need to resolve server name for each user session, for example, if the same server has several IP addresses. In this case, you should uncheck this option. Delimiter for CSV files: Here you can select a delimiter that will be used to separate entries in generated CSV files. You can use either semicolon, comma, tab or space symbol as a delimiter. Save log files to: Here you can change the default location for saving the log files. When WAPT Pro workplace downloads users' logs from agents, it saves them to this folder. Save report files to: Here you can change the default location for saving the HTML Reports. Save result files to: Here you can change the default location for saving WAPT Pro result files. Save CSV results to: Here you can change the default location for saving the CSV results.